Classic mysteries with a challenging twist. Read about the mystery brewing at Spill the Beans Coffee Shop: the suspicious meetings over cappuccino, the roundtable of gumshoe regulars and the murder that shocks them all. Next, assemble the 1000-piece puzzle to discover the hidden clues. 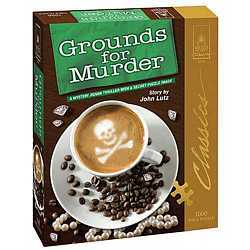 Let your mind percolate through the evidence, then filter out the red herrings and solve "Grounds for Murder". BEWARE!! The puzzle is different from the box cover. 1000-piece puzzle, story booklet. Completed puzzle measures 23" x 29".